In this post I will take a deep dive into the world of auto-investing on the Mintos crowdlending platform. It’s a feature that allows you to let the platform invest your funds for you while you sit back and relax and watch your money grow. For those of you who are new to the concept of crowdlending, I suggest you read my post about Mintos first and then come back here. Also note that although I use affiliate links, I am in no way suggesting Mintos is something for you. I really like the concept and invest in crowdlending to diversify my portfolio, but as with any investment, you will need to make your own decision based on your personal investment profile. There are two ways of investing on Mintos. Manual or automatic. The manual way means ultimate control as you will handpick each and every loan you invest your funds in. Ultimate control is great, but also time consuming. Especially if you take diversification seriously (which you really should). It requires you to constantly search for good loans across different loan originators, countries, loan types, etc. Your funds will be invested immediately – provided suitable loans can be found. In other words, your money will not sit idle while you attend to other things (sleep, watch your favorite show on Netflix, go on safari…you get the idea). It’s less time consuming. You can sit back an relax while auto-invest does the work for you. This includes making sure your investments are properly diversified. In other words, you can be mostly passive. You can configure exactly how much money you want to keep available for manual investing and how much should be invested automatically. But let’s have a look at the interface. 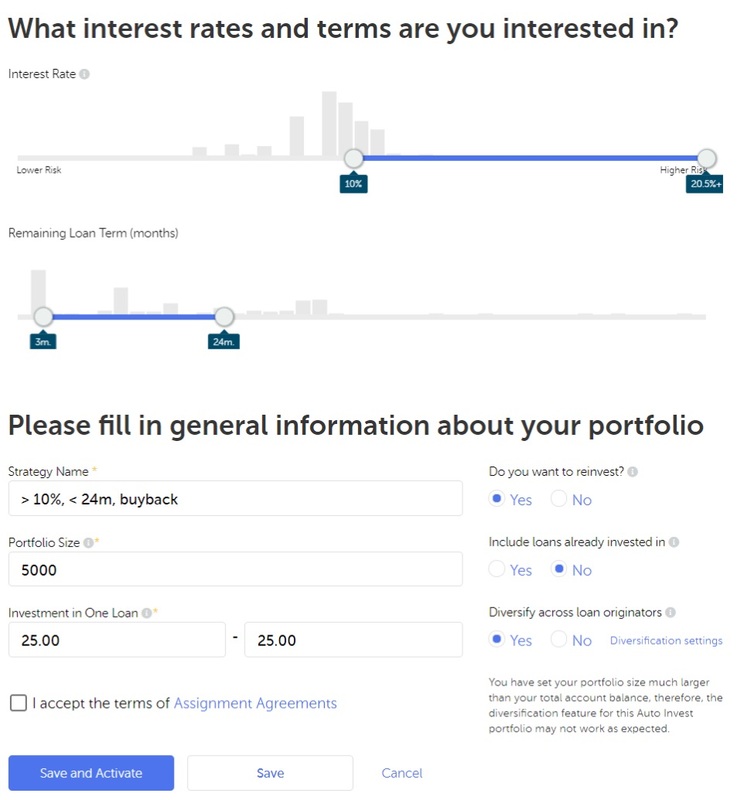 On the main menu, simply click ‘Auto Invest’. This will bring you to the main screen or dashboard. Not very spectacular (yet), but there are a few things worth noting. First of all, if you click the Set the limit of minimum funds in the account link to the right you will be able to set the minimum amount you want to keep available for manual investing. In other words, only the funds that exceed your limit will be auto-invested. The rest will be available for manual investing. Mintos has embedded their auto-invest faq on this page as well, so you will be able to get answers to the most common questions right here. To create an auto-invest strategy, click the button ‘Create new Auto Invest strategy’. This will bring you to the a page where you can choose between creating a Mintos investment strategy or a custom strategy. I haven’t tried any of the Mintos strategies. But if you want to setup things quickly and don’t want to be bothered with all the details, then this may be the best option for you. There are a few things to note however. The Mintos strategies are available only in Euro and Polish Zloty (PLN). More currencies are likely to be added in the future. All 3 strategies invest in loans with and without buyback guarantee. The short-term and diversified strategies invest in all loan originators. This is something to think about as not all loan originators have the same rating. In addition to the risk that a borrower may default, a loan originator may go out of business as well. In my custom strategies I only invest in low and moderate risk loan originators (Mintos ratings A+, A, A-, B+, B, B-). Even though Mintos strategies offer a one-click (or is it a two or three-click) way to setup your strategy, you can still update it to reflect your particular wishes (e.g. increase the gross annual interest rate). To create a custom strategy, click the ‘Custom Strategy’ button at the top. This opens the following page (click to enlarge). This part of the page is pretty self-explanatory. However, do familiarize yourself with the various loan originators, the loan types they offer, whether or not they offer loans with a buyback guarantee, etc. Note that when you select a currency in the Currency drop down list, only loan originators offering loans in that currency are shown. Also, if you click the Show summary link in the ‘Loans that match your criteria’ box, you’ll see the distribution of the loans with respect to loan type, country and loan originator. This is a useful feature that can tell you whether your strategy has the potential to generate the desired effect, e.g. with respect to diversification. More about that later. To select or deselect a loan originator, loan type, country or buyback guarantee/no buyback guarantee, simply check or uncheck the corresponding checkbox. Only select loans secured by a collateral. These are home loans, business loans, agricultural loans, pawnbroking loans and car loans. I must admit I only follow the first part of this strategy. The majority of the loans I invest in are personal loans. I do trust however that the buyback guarantee will come to the rescue in case of a default. The bottom part of the ‘Custom strategy’ page is where you setup the remaining rules of your strategy. That’s pretty straightforward as well. You can use the sliders to set the minimum/maximum interest rates and minimum/maximum remaining loan term. The latter depends mainly on your investment horizon. I typically set my strategies from 3 to 24 months. This means that some investments will first be fully repaid after 2 years (if you want to withdraw your money you can chose to sell your investment on the secondary market, but that is something for another post). I recommend you start with selecting the loan originators and loan types that you are interested in and then play around a bit with the two sliders. Each time you move them the ‘Loans that match your criteria’ box will be updated (after a pretty decent delay by the way, so be a bit patient). Each time the box gets updated, click the Show summary link to get an idea of the distribution. If you see that relatively few loans match your criteria and only for a few loan originators, it is a sign you should ‘widen’ your criteria. The ‘Do you want to reinvest’ option simply means that any loan repayments and interest that you receive will be reinvested. If you were to say ‘No’, then only funds you add yourself will qualify for auto-investment. What you want to achieve is a good diversification of your portfolio across loans, loan originators, loan types and countries. Why? Well, let’s assume you have invested all your money in a single loan without buyback guarantee. And the borrower defaults. You would lose your entire investment amount. Or maybe you invested in many loans, but from only one loan originator and the loan originator goes out of business. Although Mintos will do what they can to get your investment back, you have no guarantee. The good thing is that auto-invest can automatically diversify for you. While it looks very simple (just choose ‘Yes’ for ‘Diversify across loan originators’ right? ), achieving optimal diversification requires you to understand a few basics. The amount you set in the ‘portfolio size’ field (S). This has nothing to do with your current funds, but represents the target size of your auto-invest portfolio for this particular strategy. Which corresponds to 10% of the entered portfolio size. You can actually see this by clicking the Diversification settings link. You can override the defaults in this screen if you like. Just make sure it totals 100%. That’s pretty much it right? Well, not quite. Let’s assume you have 1000 Euro in funds. As the maximum amount per loan originator is 500 Euro you risk that there isn’t an optimal diversification of available funds. Worst case, your 1000 Euro will be distributed over only 2 loan originators even though you have selected 10. You can avoid this by entering a portfolio size that is rather close to your available funds. If you would enter 2000 for example, then the maximum amount per loan originator would be 200 Euro and your investments would be spread across a minimum of 5 loan originators. There is another catch however. 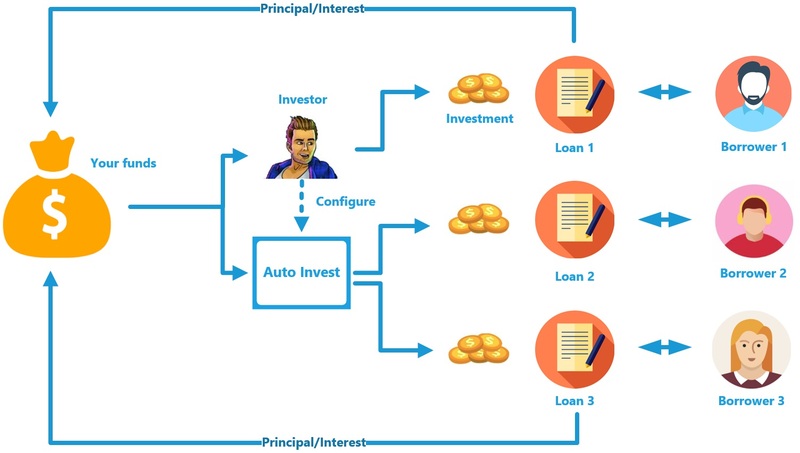 Auto-invest will only invest in suitable loans. If there aren’t sufficient suitable loans then diversification will not be optimal either. To illustrate, let’s assume you have set a minimum interest rate of 15% and only 2 loan originators offer loans with that rate. In that case it doesn’t help that you have selected 10 loan originators in your strategy. Auto-invest will have only loans from the 2 loan originators to invest your funds in. And when the maximum amount has been reached (e.g. 200 Euro from the example above), then auto-invest runs out of options and you will find that your funds aren’t even being invested. The solution is to make sure there are sufficient suitable loans. Again, check the ‘Loans that match your criteria’ box and the distribution (by clicking the Show summary link). Parameters that affect diversification as well are the values you enter in the ‘Investment in one loan’ fields. Here you can set the minimum and maximum amount that you want to invest on one loan for this particular strategy. To optimize diversification I use the values you see above. This means that I never invest more (or less) than 10 Euro in any single loan. As my funds increase I will probably increase this a bit, maybe even up to 100 Euro at some point. Apart from possible lack of suitable loans, the demand from the various auto-invest portfolios for a single loan may exceed the available loan amount. If there is a loan amount of 1000 Euro and 100 auto-invest portfolios that all want a slice of 25 Euro, then not every portfolio can make the investment. Mintos doesn’t say what algorithm they use for the prioritization of auto-invest portfolios. They call their algorithm ‘proprietary’. Not because the underlying code is rocket science, but because they want to avoid discussions. That’s my guess at least. But I could imagine that portfolio size plays a role. It is possible to create multiple auto-invest strategies. Auto-invest will execute them in the order that they appear. But remember that auto-invest strategies require maintenance (e.g. updating portfolio size, adding/removing loan originators) and that you always should monitor how the diversification process is playing out. I have had some undesired effects with my diversification, mostly due to the learning curve. But after the necessary adjustments, I am well on my way with getting the portfolio I want. You can stop and restart your strategies at any time. You can change your already running auto-invest strategy at any time. Just be aware that it may take time for the portfolio to adjust. Let’s assume you started with a portfolio size of 5000 Euro and 10 loan originators. That means a maximum amount per loan originator of 500 Euro. Now, if you would change the portfolio size to 2000 Euro (200 Euro per loan originator), then one or more loan originators may already have an investment that exceeds that amount. Auto-invest can not instantly change that. Even though you have reduced the portfolio size (hence the maximum amount per loan originator will drop), it takes time for the new strategy to be reflected in the portfolio. This is because auto-invest only works with available funds, which means it is dependent on loan repayments (or fund deposits of course). How fast a changed strategy is fully reflected in the portfolio depends on how ‘mature’ the strategy is at the time of the changes, what changes you make and what the remaining loan terms are. As of December 3rd, 2018, you can also auto-invest in loans on the secondary market. This is where other investors sell their investments in loans for a premium or at a discount. I will post an update on this once I have access to the feature. I love the auto-invest feature on the Mintos platform. It allows me to focus on the long term strategy, rather than having to spend too much time on finding suitable loans to invest in. It is easy to setup, although I did find that the way diversification works was a bit hard to grasp initially. But with a little ‘trial and error’ I was able to master it. Hopefully you can avoid the same ‘beginner mistakes’ after reading this post. Excellent review on Mintos! I’ve been with Mintos for a few months but only in GBP for now which really limits me to Mogo. I plan on adding Euros in the next few weeks so this helps me think about diversifying in to other loans. I only just came across your blog so enjoying reading.